My hands had no sooner finished unloading the images from Shades I, when I had instant messages springing up on my Facebook page. The response was overwhelming. People were genuinely excited about this project. So immediately I set my mind to work. Where? When? What time frame? Could we get the same caliber of professionals on board? I decided to see what the response would be. So I picked a date, working around some of the area actors who knew that shortly after the holidays their schedule would book up. So January 4th became our when. We then picked a time frame that spoke to me of a time of elegance, of intrigue, and not just a little bit of magic. The Victorian and Edwardian Eras have captured imaginations time and time again, and most currently in the genre of Steampunk, which is a genre of science fiction, set in the Victorian or Wild West times, that typically features steam-powered machinery rather than advanced technology. The two ideas married each other almost seamlessly. The place was a no brainer. Portsmouth, NH heralds a gorgeous, historical district, full of old houses, ancient graveyards, narrow street ways, and eclectic gardens. It was perfect. Finding the who, what, when and where was not a problem. I immediately had professionals that were anxious to be on board, lending help in any way that they could. Hairdressers, costumers, makeup artists, models, it was humbling and overwhelmingly wonderful. No, my biggest problem was going to be where to house in upwards of 50 people in the middle of winter. My anxiety was eased when Bill Humphrey’s responded that we could use Portsmouth’s own PPMtv studio as our home base. It was PERFECT. A less than 5 minute walk from all of our locations, it was big enough to be a home to our basecamp, keeping all of our artisans warm and cozy. PPMtv in the heart of historic downtown Portsmouth. The months leading up were busy, as the holidays always are. 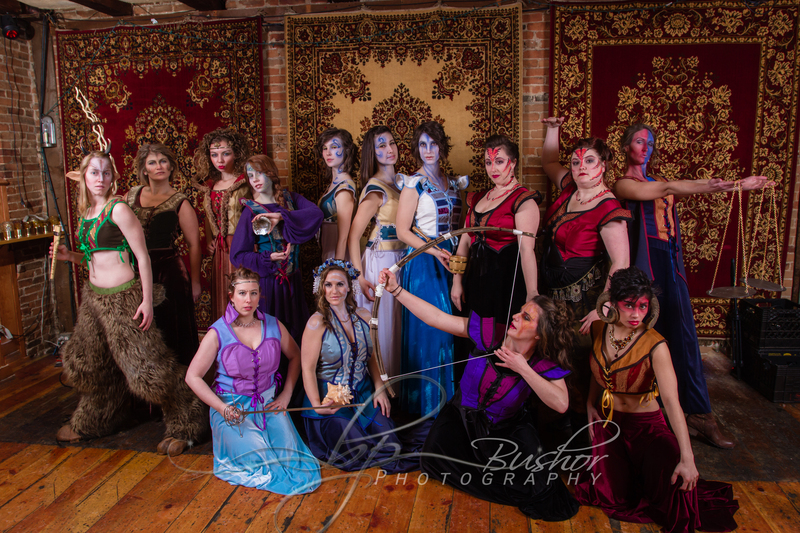 And I discovered a wonderful network of individuals who helped me to find costuming, and accessories for our models. As much as I should have been crazy, I found that the magic of this project was once again in full swing. The right people were contacted, and were available, and things fell into place. We made a schedule of events, and booked in our models at different venues for different times, our major concern was to keep everyone warm and safe. The night before the event was here before we knew it, and much like Christmas Eve, anticipation filled the air. A new blanket of snow had covered the ground, and temperatures ranging from negatives to the teens were in the forecast for the following day. We got to our “home” and started setting up for the next morning. It was then that I got the call from one of my hairdressers, that due to the storm that had just hit, and the massive cold front that the Polar Vortex had saddled us with, her plane was delayed from Texas, and she didn’t know when she would be home. As an aside, when you are working on things of this magnitude, snags will happen; you just have to ride the wave. Fight it and you just might go under. I let my other hairdresser know that she would be flying solo, and wished her luck. (I am truly blessed to know people who are up for an adventure!) It was on that note, that we finished what we could in set up and headed home for one more sleep. The next day started, early. We were out in the dark, cold morning, bundled up against the elements. Our models began to arrive and our artisans were in full swing before we knew it. Matt, Sean, and I took in one last breath of warm air, and headed outside. Due to the extreme temperature difference, and tight time frame that we were working with, we knew our equipment would not have time to adjust to temperature shifts, so we accepted our chilly fate of at least 6 hours in the freezing cold, and stepped out the door. 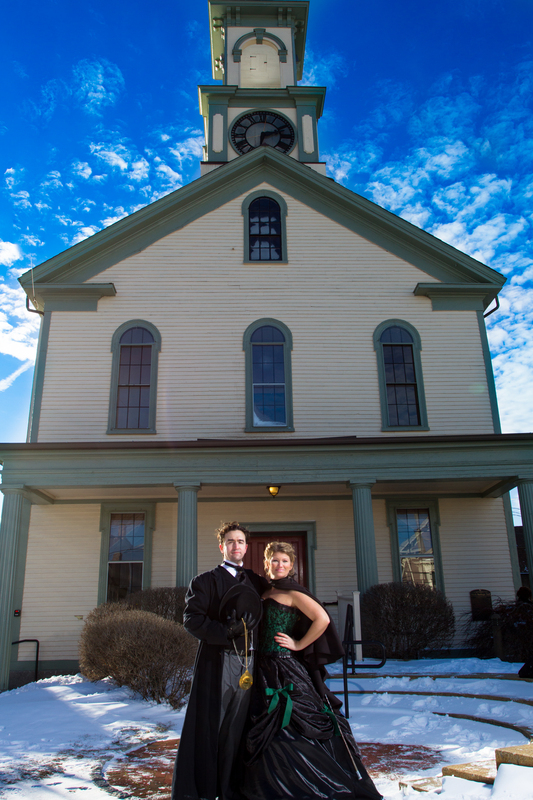 Our first stop was at Pickwick’s Mercantile where we were able to do a few shots of our “Steampunk’d Alice in Wonderland” shoot, giving our models a false illusion of warmth before casting them out into the frigid morning. 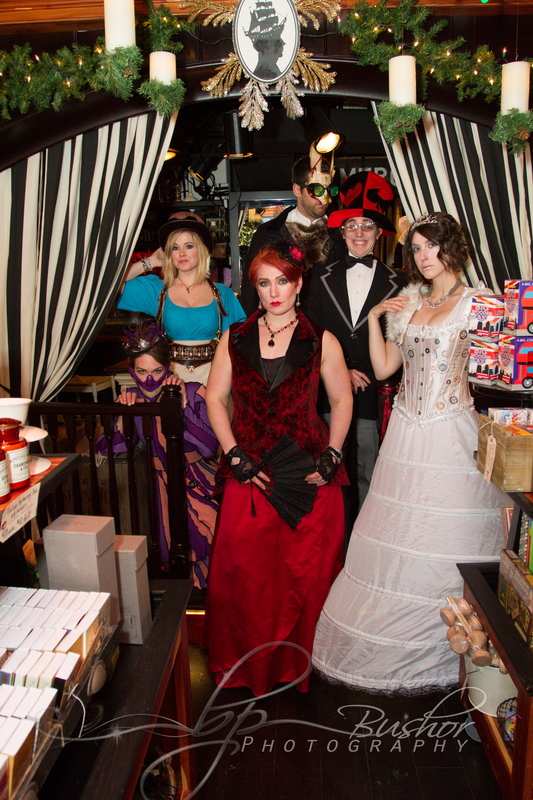 The cast of “Steampunk’d Alice” in Pickwick’s Mercantile on a frigid January morning. 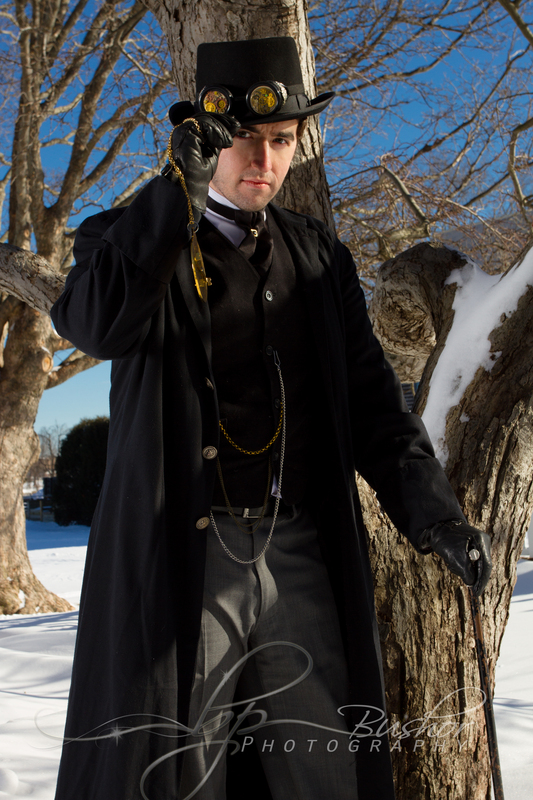 From the frozen gardens of Prescott Park, to the deathly cold hallowed grounds of Point of Graves Cemetery, our art came to life. Our models, keeping warm in cloaks and jackets till their turn, made each shot count. Standing in snow drifts, and putting on their best “warm” faces. From 8 to 3 we were out in various venues, creating art. It was a WONDERFUL experience. Our day wrapped up in the inviting warmth of The Pressroom Restaurant. We had a shoot that was set apart from the rest. One of our costumers had developed an entire line of bodices based on the Zodiac signs. As our weather worn bodies hit the warmth, and the smell of food that we had not had all day filled our nostrils, fatigue set in. But knowing that there were miles to go before we slept, we forged on. The creative energy of those around us, and the magic that kept pouring from it reenergized us, and we dove back in. Dancer’s moving in hypnotic rhythms to music not there, actors embodying mythical characters, and delicious buffalo tenders that found their way to my stomach were second to none, and before I knew what was happening, we were wrapping up, and getting ready for the bracing chilly walk back “home”. As we packed up the costumes, swept the floor, and said goodbye to our brave and enduring artists, we realized once again how truly awesome the experience had been. And we knew, as we do now, that Shades will continue. Still on the search for our next venue, we already know that we are looking to explore the beauty, glamor and intrigue of our next “Shade” the 1930’s and 40’s.